the short story "The Fall of the House of Usher"
House of Usher (also known as The Fall of the House of Usher and The Mysterious House of Usher) is a 1960 American horror film directed by Roger Corman and written by Richard Matheson from the short story "The Fall of the House of Usher" by Edgar Allan Poe. The film was the first of eight Corman/Poe feature films and stars Vincent Price, Myrna Fahey, Mark Damon and Harry Ellerbe. In 2005, the film was listed with the United States National Film Registry as being deemed "culturally, historically, or aesthetically significant." On August 6, 2010, BRIC Arts presented the film in Prospect Park with a new score and psychedelic overlays and flashforwards by Marco Benevento in celebration of the film's 50th anniversary. Versions exist on DVD with running times between 76 and 80 minutes. Philip Winthrop (Mark Damon) travels to the House of Usher, a desolate mansion surrounded by a murky swamp, to meet his fiancée Madeline Usher (Myrna Fahey). Madeline's brother Roderick (Vincent Price) opposes Philip's intentions, telling the young man that the Usher family is afflicted by a cursed bloodline which has driven all their ancestors to madness. Roderick foresees the family evils being propagated into future generations with a marriage to Madeline and vehemently discourages the union. Philip becomes increasingly desperate to take Madeline away; she agrees to leave with him, desperate to get away from her brother. During a heated argument with her brother, Madeline suddenly dies and is laid to rest in the family crypt beneath the house. As Philip is preparing to leave following the entombment, the butler, Bristol (Harry Ellerbe), lets slip that Madeline suffered from catalepsy, a condition which can make its sufferers appear dead. Philip rips open Madeline's coffin and finds it empty. He desperately searches for her in the winding passages of the crypt but she eludes him and confronts her brother. Now completely insane, Madeline avenges herself upon the brother who knowingly buried her alive. Both die as a fire breaks out, ending the Usher bloodline, and Philip escapes and watches the burning house sink into the swampy land surrounding it. The film ends with the final words of Poe: "...and the deep and dank tarn closed sullenly and silently over the fragments of the 'House of Usher'". The film was important in the history of American International Pictures which up until then had specialized in making low budget black and white films to go out on double bills. The market for this kind of movie was in decline so AIP decided to gamble on making a larger budgeted film in colour. The film was announced in February 1959 and was dubbed the company's "most ambitious film to date". A number of other companies announced Poe projects around this time: Alex Gordon had a version of Masque of the Red Death, Fox had Murders in the Rue Morgue, Ben Bogeus The Gold Bug, and Universal The Raven. It was shot in fifteen days. In February 2011 Intrada made the world premiere release of the Les Baxter score from music-only elements in mono. Eugene Archer, in the September 15, 1960 edition of The New York Times wrote, "American-International, with good intentions of presenting a faithful adaption of Edgar Allan Poe's classic tale of the macabre...blithely ignored the author's style. Poe's prose style, as notable for ellipsis as imagery, compressed or eliminated the expository passages habitual to nineteenth-century fiction and invited the readers' imaginations to participate. By studiously avoiding explanations not provided by the text, and stultifying the audiences' imaginations by turning Poe's murky mansion into a cardboard castle encircled by literal green mist, the film producers have made a horror film that provides a fair degree of literacy at the cost of a patron's patience." He further opined, "Under the low-budget circumstances, Vincent Price and Myrna Fahey should not be blamed for portraying the decadent Ushers with arch affectation, nor Mark Damon held to account for the traces of Brooklynese that creep into his stiffly costumed impersonation of the mystified interloper." Other reviewers have been kinder, however; House of Usher is now regarded as a high point in Corman's filmography, with an 89% "fresh" rating on Rotten Tomatoes. the unnamed narrator (Philip in the film) is Roderick's friend, not Madeline's fiancée. Madeline does not attack Roderick, but falls on him, and they instantly die. the house does not burn, but breaks in two before sinking. ↑ "Rental Potentials of 1960", Variety, 4 January 1961 p 47. Please note figures are rentals as opposed to total gross. ↑ Chase Still Critical Element in Comedy: Tempo and Crescendo Applied by Veteran Norman McLeod Scheuer, Philip K. Los Angeles Times (1923-Current File) [Los Angeles, Calif] 13 Feb 1959: B7. ↑ POE SCENARISTS TELL A SAD TALE: Couple Working on 1 of 6 Films Being Adapted From Writer Encounter Pitfalls By MURRAY SCHUMACHSpecial to The New York Times.. New York Times (1923-Current file) [New York, N.Y] 21 Aug 1959: 12. ↑ House of Usher. New York Times Review Retrieved 23 September 2008. 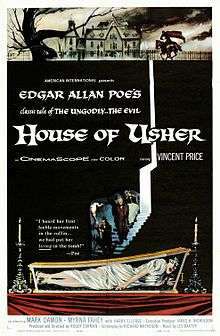 Wikimedia Commons has media related to House of Usher (film).